The Mida Converter is an application that can take your existing Delphi VCL apps which have legacy code in them and convert the code and the VCL so that it becomes a Firemonkey app. I haven’t actually tested this to see how well it works but I have some projects I would actually use this on. You can configure Mida to change properties like .caption to .text which looks helpful. It will even convert TImage components and their contents (or so it says) straight across from VCL to Firemonkey. Every Delphi XE5 should keep Mida Converter in their tool chest even if you don’t have any legacy code you could use it convert VCL demos, code snippets, and maybe even components to work in Firemonkey for you. 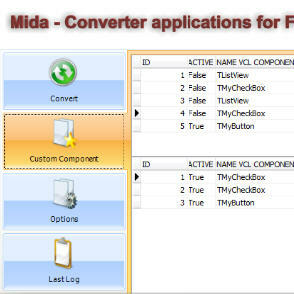 Take a look at Mida Converter and try it out for yourself.